After reviewing the ULS logs I found that there was an error creating a list called '_catalogs/wfpub' on the root site. 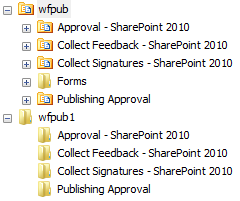 In SharePoint Designer I went to All Files/_catalogs and noticed that there was a sub folder called wfpub and within that folder there were empty subfolders for each of the OOTB workflow templates. The icon for wfpub was a directory icon, not a list icon. I renamed the wfpub folder to wfpub1 and reactivated the Workflows feature. This time it worked, a new wfpub list was created and the templates were showing up in the document library workflow settings. One piece of fall out from this is that by deactivating the Workflows feature on the site collection, it removed an OOTB workflow that was setup for a list on a subsite. It was easy enough to recreate but you should probably go through all webs in the site collection and document the workflows that are there. Great write up, thanks Adam!